This sculpture is in perfect condition. 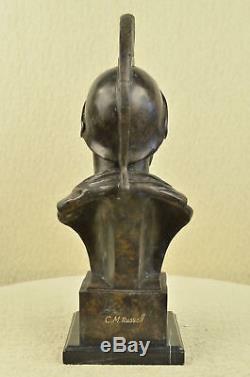 Bronze Dimensions with Marble Base:Height 19" x Width 11". Marble Dimensions:6" X 6". 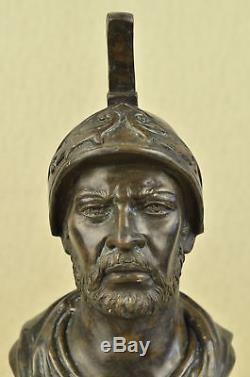 A Roman warrior is frozen in time with this bust sculpture. He has the aged face of war, struggle and survival. He carries the burden of. Being a husband, father, protector, soldier and leader. The mirrors of all he has seen are framed by furrowed brows. He has a scruffy beard. That has been shaved in months. Sweat drips from beneath his heavy helmet that he wears more often than not. 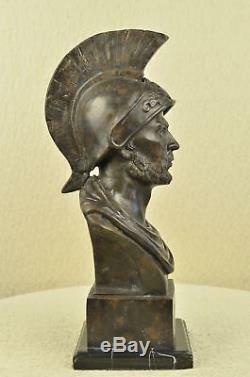 100% bronze and handmade, this two-toned brown patina sculpture was cast using the "Lost Wax Method" and mounted on a marble base. Virgin Islands, however, an additional charge may be required. 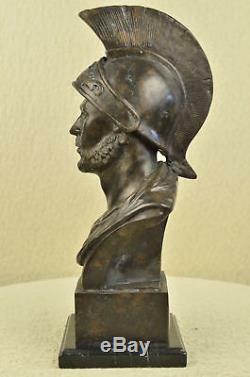 The item "Ancient Male Bronze Metal Bust Classical Greek Roman Sculpture Head Statue Deco" is in sale since Sunday, March 18, 2018. This item is in the category "Antiques\Reproduction Antiques". 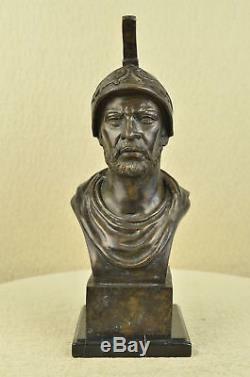 The seller is "exotic_bronze" and is located in Los Angeles, California. This item can be shipped worldwide.